Loosely defined, Advent is the period of time leading up to Christmas when we commemorate Christ’s first coming and anticipate His second coming (click here to learn more). And what better way to do so than by making Bible study and worship part of your family tradition? 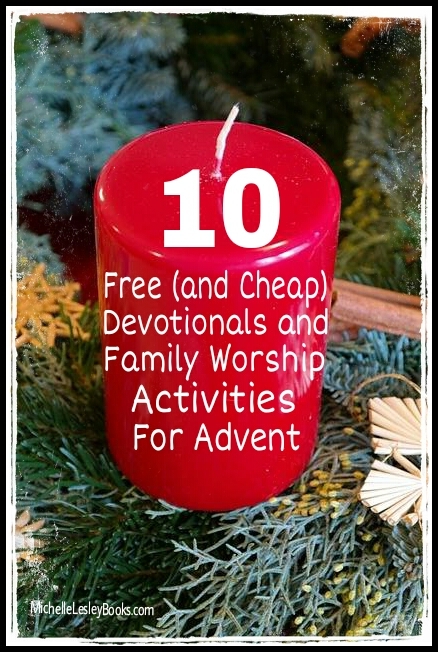 Here are ten Advent resources for young and old alike (and nearly all of them are FREE). Please note, I tried to vet these resources and writers as best I could for sound doctrine, but not all of these folks are thoroughly familiar to me, nor have I read all of these materials. Be discerning, and always make sure every teaching you embrace matches up with what God’s word says. 1. December Advent!– Naomi’s Table is a women’s Bible study program/podcast that I highly recommend for sound doctrine and right handling of God’s word. Have a listen to their daily Advent podcasts and make the Advent calendar that goes with them! 3. The Dawning of Indestructible Joy– “These 25 brief devotional readings from John Piper begin on December 1 and carry us to Christmas Day.” Download the PDF or audiobook for free. You can also purchase it in paperback or Kindle formats. 4. Let Every Heart Prepare Him Room– This is a family Advent devotional from Bible teacher and mom Nancy Guthrie. Along with devotions for every day in December, this resource includes explanations of some hard-to-understand aspects of popular Christmas carols and discussion questions to draw in your elementary through high school-aged kids. 5. Joyous Expectation– Lynnae McCoy is doing a weekly Advent devotional. This week she helps us remember that “The King is on the way!” with a free printable. 6. Good News of Great Joy– These Advent meditations are excerpted from the ministry of John Piper and correspond to the daily readings in Desiring God’s free devotional app, Solid Joys. The e-reader and PDF versions and apps are all free to download. 7. Worship Ideas for Family Time at Christmas– Jerry Vogel and his wife “always plan a dedicated time for family worship.” Here’s how they did it. Maybe it would be a fit for your family, too. 8. The Christ of Christmas Advent Devotionals– These weekly devotional readings are excerpted from Calvin Miller’s book, The Christ of Christmas. 9. Journey to the Manger– Advent fun for kids from Thriving Family (a ministry of Focus on the Family). Free downloads include: Advent poster, Bible character cutouts, daily faith activities, and puzzles. 10. Names of Jesus Advent Chain– Paper chains are a fun and easy craft for families with little ones, and this one even comes with a printable template. Count down to Christmas with the Names of Jesus Advent Chain from Spell Outloud.